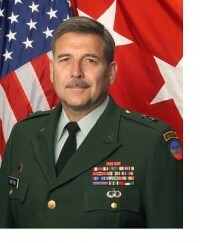 Major General William D. Wofford currently serves as the Adjutant General of Arkansas National Guard. He serves as a member of the Governor’s Cabinet and Commander of the Military Department of Arkansas. He is responsible for all military administration transactions between the United States and the State to include personnel, finance, and logistics. He is responsible for training of personnel to accomplish both the state and federal missions of the National Guard, and performs all other duties pertaining to his office as prescribed by law. Major General Wofford was commissioned a Second Lieutenant, Field Artillery, upon graduation from the Reserve Officer Training Corps program at Arkansas Tech University, Russellville, Arkansas, on May 15, 1971. After completion of the Field Artillery Officer Basic Course at Fort Sill, Oklahoma, Major General Wofford served on active duty with the 82nd Airborne Division and the 1st Armored Division until he returned to Arkansas where he joined the Arkansas Army National Guard in December 1975. Major General Wofford served in a variety of command and staff positions, including Commander, 5th Battalion 206th Field Artillery and brigade-level command of 87th Troop Command. During Operation Desert Storm he served as Commander, 2nd Battalion 142nd Field Artillery, an eight-inch self-propelled artillery battalion. He served on The Adjutant General’s staff as the Plans, Operations and Training Officer (G-3/5/7), Chief of Staff for the Arkansas Army National Guard, and as Deputy STARC Commander/Commander, Arkansas Army National Guard. Major General Wofford served as the Deputy Commanding General (Reserve Component), U.S. Army Forces Command, Fort McPherson, Georgia. On April 28, 2005, he received federal recognition as Major General (Line).